C. Hart Merriam had just two months to assemble a top-flight team of scientists for the Harriman Expedition. He did not have the advantage of time, but he did have other resources, including financial. 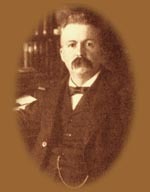 Edward H. Harriman, who had significant financial resources, funded the entire cost of the expedition himself. Harriman handled all the travel arrangements, including the chartering of a special train and the refurbishing of the steamship, the George W. Elder. Still, Merriam's job was a big one: he had to convince some of the finest scientists in America to interrupt their busy schedules for this two-month voyage along the Alaska coast. In the end, Merriam proved truly successful. The illustrious group he recruited reflected the state of scientific scholarship in the late 19th century. The scientists invited on the Elder were white men; it would be very uncommon, in 1899, to find women and ethnic minorities holding top university and government positions. But Merriam's choices were diverse in other ways. Some of the scientists were highly accomplished and already had experience in Alaska. Others were young - Charles Palache, in his early twenties, had to postpone his wedding to go on the trip. Trevor Kincaid skipped his college graduation. The real diversity of the group was in its broad range of interests. Today, Harriman's team would be called "interdisciplinary," having specialists from many different fields. Such a group was most unusual in the late 19th century. Ornithology, the study of birds, was one of the oldest branches of science represented on the Elder. Aristotle, the Greek philosopher, had argued that the careful study of these feathered creatures was a noble human pursuit. In 1899, it was also something of a deadly pursuit, for the birds at least. 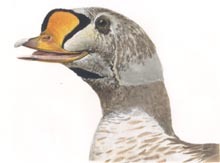 Elliot Coues, the most respected ornithologist of the day, urged scientists to collect as many of one type of bird as possible, fifty being the lowest number of each species necessary to build a truly worthy collection. "Enough birds of all kinds exist to overstock every public and private collection in the world, without sensible diminution of their numbers," said Coues. On the Elder, and on many scientific expeditions, large numbers of birds were collected, preserved and studied as specimens. 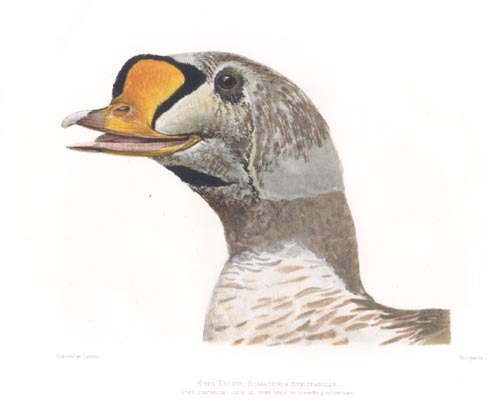 King Eider, male in breeding plumage, painted by Louis Agassiz Fuertes, Port Clarence, Alaska, July 12, 1899. Zoology, the general study of animals, had, in 1899, many specialized branches. Systematic zoology, of which Merriam himself was an expert, was the classification and study of the geographical distribution of a species; structural zoology looked at the anatomy of living and fossil species; physiological zoology looked at an animal's behavior and function; experimental zoology included the study of genetics; philosophical zoology focused on the study of evolution. The botanists, the scientists who study plants, were, like the ornithologists, avid specimen gatherers. 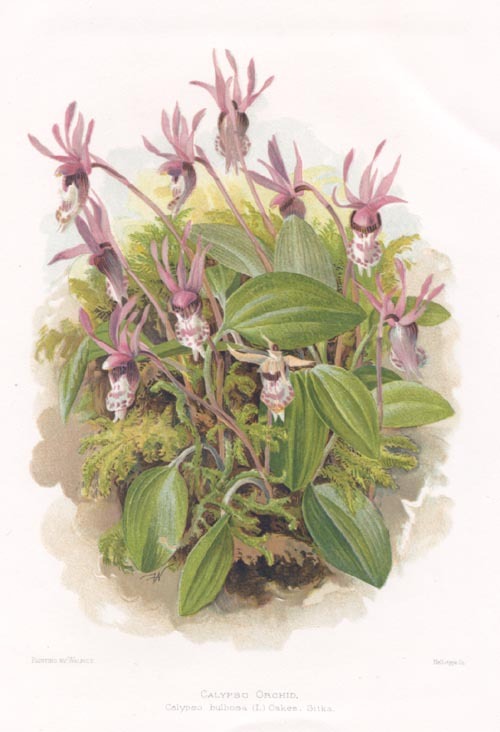 They collected hundreds of mosses, lichens, and fungi, along with ferns and flowering plants from areas that, before the Harriman Expedition, were largely unknown to botanical science. The research from this trip yielded a good deal of information about the distribution of Alaskan plants, information that others later used as a base-line from which to judge the health of the Alaskan coastal ecosystems. 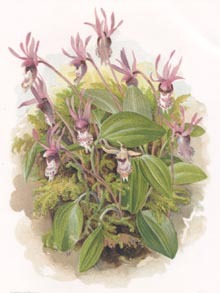 Calypso orchid, painted by Walpole, Alaska, 1900. In much the same way as the botanists, Bernard Fernow, the forestry expert, provided a base-line assessment of the Alaskan forests. But forestry, unlike botany, was a new science in the United States. As a forester, Fernow looked at the overall health and economic value of a particular area, rather than at the individual specimens within a species. He did not collect trees, but rather made a judgment as to the overall vigor and value of the forests he saw. Anthropology, like forestry, was one of the newer branches of study represented on the Elder. Defined in 1866 as "the study of man as an animal," the anthropologist looked at a group's language, art, cultural practices, food, agriculture, and other aspects of human society. Within anthropology, written reports and data were as important as specimen collection, but artifact collection did take place on the Elder. There was much souvenir buying at many of the stops along the way, and the most prized souvenirs were those offered by the Alaska Native communities. On the trip north, the passengers of the Elder purchased Tsimshian objects at the village of Metlakatla. On the return trip, the expedition collected a large number of totems and other ceremonial objects from the Tlingit village of Cape Fox, for distribution to museums and private collections in America. 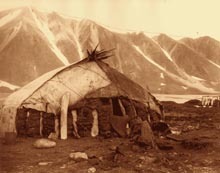 Eskimo woman in front of her winter hut, photographed in Plover Bay, Siberia by Edward Curtis, 1899. One of the most important findings of the 1899 Harriman Expedition involved glaciology, the study of glaciers. G. K. Gilbert, a geologist known for his meticulous field work, used his own observations and the hundreds of glacier photographs from the trip to develop theories about glacial climate, topography and motion that truly advanced the scientific understanding of glaciers. 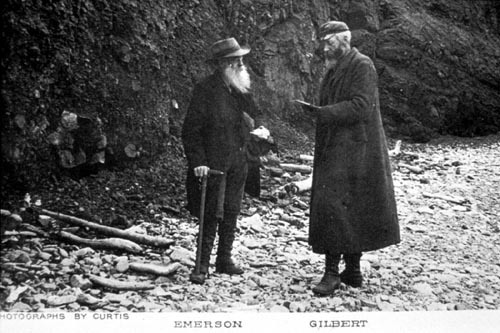 B. K. Emerson and G. K. Gilbert examine a rock specimen found in a glacial moraine. Photographed by Edward Curtis, 1899. One of Harriman's goals for the trip was the wide dissemination of the expedition's findings, and Merriam knew that good writing would make the reports more popular. 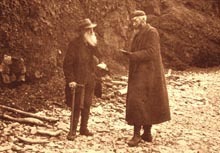 Two nature writers, John Burroughs and Charles Keeler, were invited to join the trip, and Burroughs was commissioned to write a full volume history of the expedition for the general public. Merriam knew that maps, sketches, paintings and photographs would make the published work more accessible to the general public, and he saw to it that the party included two landscape painters, two photographers and one wildlife artist. By any measure, the Harriman Alaska Expedition made a tremendous contribution to the scientific and the popular understanding of Alaska in 1899. The findings revealed much about the long, rugged and beautiful coastline, a territory that was, at the turn of the last century, entirely unknown to most Americans. Now, more than a century later, the observations made on that expedition remain an important part of Alaskan history. 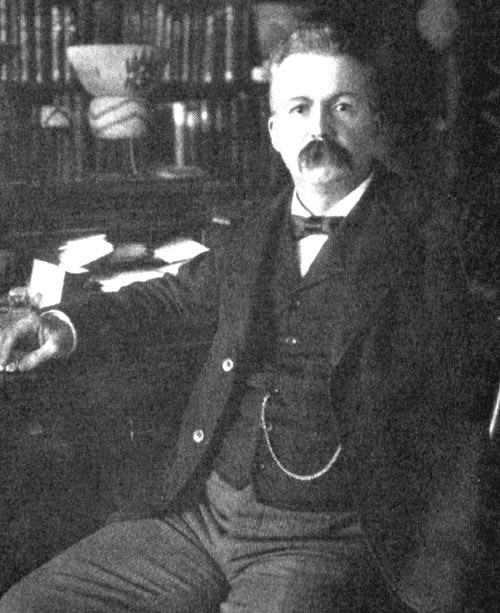 C. Hart Merriam, photographed in his Washington, DC office. "During the two month's cruise a distance of nine thousand miles was traversed. Frequent landings were made, and, no matter how brief, were utilized by the artists, photographers, geologists, botanists, zoologists, and students of glaciers." "On the Elder I found not only the fields I liked best to study, but a hotel, a club, and a home together with a floating university. I enjoyed the instruction and companionship of a lot of the best fellows imaginable." John Muir, writing to the Harriman children after the trip, a letter dated August 30, 1899. "The Northwest crows and the ravens force themselves upon our attention from the outset. We are accustomed to think of ravens as sly birds dwelling in remote and desolate places upon the wastes of the plains or on the dreary rough bound sea coast. But at every village in Alaska they're as abundant and keen as chickens in a barnyard." "In exploring the surface of a glacier I found that many insects encountering the cold currents from the ice were numbed and drifted over the surface of the ice to be lodged in crevices. In collecting these insects I used my ice pick to enlarge the crevices and to my surprise found that embedded in the clear ice were numbers of small brown worms." Trevor Kincaid, in an unpublished memoir, writing about his research with the Harriman Expedition. "When we consider that the central Californian 'golden-back' fern (Cerepteris triangularis) is found as far north as Cape Nome we are forced to the conclusion that there are climatic conditions existing in the Alaskan region that are favorable to the growth of plants of a much lower latitude." Lucien M. Underwood of Columbia University, writing in Science, June, 1904, about the botany reports in Volume V of The Harriman Alaska Expedition. "Ugak Bay on the east, and Cape Uganok on the west side of the island, are the farthest western and southern points of forest growth. ...There is some evidence that this western limit is not or may not remain stable, that the spruce has wandered in recent times and may still wander. There is also evidence that the treeless country beyond... is not incapable of growing trees." Bernard Fernow, discussing forestation patterns in Volume II of The Harriman Alaska Expedition. 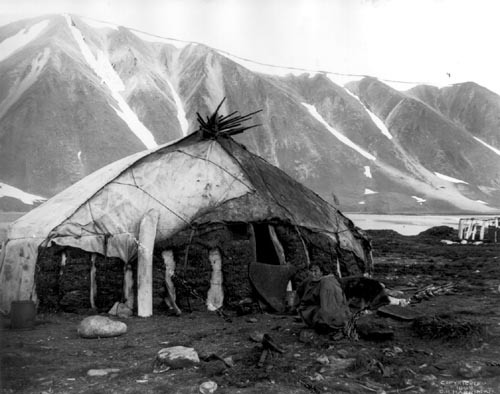 "The two seal hunters in the canoe may be two men, or a man and his wife, or a man and a boy. The hunter sits in the bow and his companion in the stern, while amidships are placed three or four large stones for ballast, weighing in the aggregate 150 or 200 pounds... When a seal is taken into the boat an equivalent weight of stones is thrown overboard to lighten the canoe. Often before noon the canoe has all the seals that it can carry, and returns to camp." Part of George Bird Grinnell's detailed account of seal hunting near Yakutat, from Volume II of The Harriman Alaska Expedition. "The combination of a climatic change of a general character with local conditions of a varied character, may result in local glacier variations which are not only unequal but opposite." G. K. Gilbert writing on the complex influences of glacial activity in Volume III of the Harriman reports, Glaciers and Glaciation.